Priced below KBB Fair Purchase Price! Carfax One-Owner. GPS / Navigation**, Moonroof / Sunroof**, Lots of Factory Warranty Remaining**, Front winch!, Ram 2500 Power Wagon, 4D Crew Cab, 6.4L V8, 4WD. 6.4L V8 Reviews: * Monumental torque with diesel and automatic powertrain high-quality cabin Mega Cab's roomy rear seat highly off-road-capable Power Wagon version quiet, comfortable ride. according to Edmunds * If you want a heavy-duty truck engineered to give you the power you need and deliver it in a gorgeous package, look no further than the Ram 2500. With its signature rounded curves and huge front grille, this truck is instantly recognizable and respected wherever it goes. The Ram 2500 is sold in 3 sizes: Regular Cab, Mega Cab and Crew Cab, and has a wide range of trims to choose from. 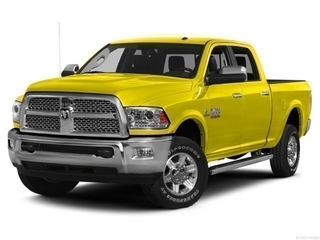 The Regular Cab offers 3 options: the base level Tradesman, the Big Horn and the SLT. The Mega Cab has 4 trims, with the SLT being the lowest. Finally the Crew Cab offers a stunning seven trims to pick from with the Tradesman being the lowest. All Ram 2500 trucks come standard with an impressive 5.7L HEMI V8 Engine with 383 HP and 400 lb-ft of Torque, and an Automatic 6-speed transmission. It is also available in two-wheel drive and four-wheel drive versions on most models except the following Crew Cab Trims: Tradesman Power Wagon, Outdoorsman, Power Wagon, and Laramie Power Wagon where 4WD is the only option. The interior environment has a polished feel even on the base trims. The regular cab can seat 3 on a bench, and the 4-door versions can either seat 5 when there are two-bucket seats up front, or 6 people on 2 rows. The Mega and Crew cabs add a Uconnect communication system, media hub, and all models include the Vehicle Information Center. 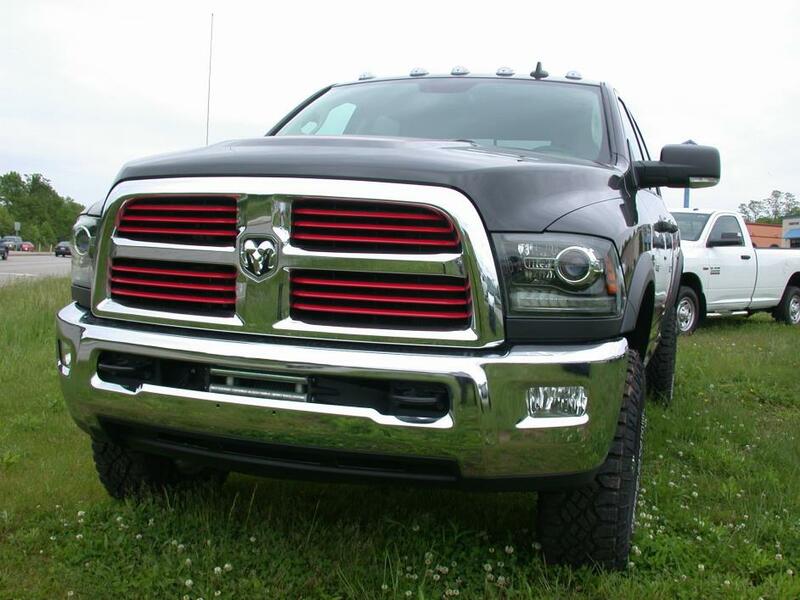 Ram has an impressive list of optional features that are available based on what model you want such as: a 6.4L HEMI V8 engine, a 6.7L V6 Turbo Diesel Engine, the RamBox Cargo Management System, a Navigation System, Auto-dimming Rear-view Mirror, Upgraded Sound Systems, and Premium Cloth or Leather Seating. For safety, all models come standard with Anti-lock brakes, Stability Control, and Six Airbags. as reported by The Manufacturer Summary * Massive interior room low step-in height available fuel-efficient diesel engine. according to Edmunds We will pay top dollar for your car, even if you don't buy one from us! Don't make a $2000 mistake and pay too much somewhere else! Be sure to check with us before you buy! 2500 Power Wagon, Power Wagon, Mann Chrysler Dodge Jeep Ram of Richmond will not be undersold on ANY new product! From our 5 Star Sales Service Department, to our convenient clean facilities, and commitment to customer satisfaction we strive to provide the ultimate in customer satisfaction! Call us today and get your BEST price on your next new vehicle and you WILL drive away saying 'Mann, What A Deal'!, 1 Year Trial,115V Auxiliary Power Outlet,4.10 Rear Axle Ratio,40/20/40 Split Bench Seat,5-Year SiriusXM Traffic Service,5-Year SiriusXM Travel Link Service,50 State Emissions,8.4' Touchscreen Display,9 Alpine Speakers w/Subwoofer,Air Conditioning ATC w/Dual Zone Control,Auto Dim Exterior Mirrors,Charge Only Remote USB Port,Electroluminescent Instrument Cluster,Engine: 6.4L Heavy Duty V8 HEMI w/MDS,Exterior Mirrors Courtesy Lamps,Exterior Mirrors w/Supplemental Signals,Folding Flat Load Floor Storage,For Details Visit DriveUconnect.com,Front and Rear Rubber Floor Mats,Front Armrest w/Cupholders,Front Center Seat Cushion Storage,GPS Antenna Input,GPS Navigation,Glove Box Lamp,HD Radio,Heated Front Seats,Heated Seats and Wheel Group,Heated Steering Wheel,Integrated Voice Command w/Bluetooth,LED Bed Lighting,Leather Wrapped Steering Wheel,Luxury Group,Media Hub,Overhead Console w/Garage Door Opener,ParkSense Rear Park Assist System,Power 10-Way Driver Seat,Power Folding Mirrors,Power Heated Fold-Away Mirrors,Power Lumbar Adjust,Premium Cloth 40/20/40 Bench Seat,Quick Order Package 22P Power Wagon,Radio: Uconnect 8.4 NAV,Rear 60/40 Split Folding Seat,Rear Dome w/On/Off Switch Lamp,Remote SD Card Slot,Remote Start System,SiriusXM Traffic,SiriusXM Travel Link,Spray In Bedliner,Steering Wheel Mounted Audio Controls,Sun Visors w/Illuminated Vanity Mirrors,Transmission: 6-Speed Automatic,Uconnect Access,Underhood Lamp,Universal Garage Door Opener Mann Chrysler Dodge Jeep Ram of Richmond will not be undersold on ANY new product! From our 5 Star Sales Service Department, to our convenient clean facilities, and commitment to customer satisfaction we strive to provide the ultimate in customer satisfaction! Call us today and get your BEST price on your next new vehicle and you WILL drive away saying 'Mann, What A Deal'! 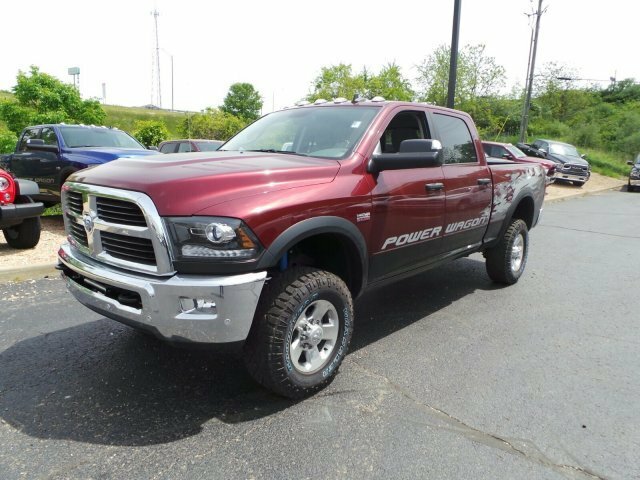 2500 Power Wagon, Power Wagon, This Ram 2500 delivers a Premium Unleaded V-8 6.4 L/392 engine powering this Automatic transmission. Wireless Streaming, Wheels: 17' x 8.0' Aluminum, Vinyl Door Trim Insert. This Ram 2500 Comes Equipped with These Options Vendor Painted Cargo Box Tracking, Variable Intermittent Wipers, Valet Function, Urethane Gear Shift Knob, Trip Computer, Transmission w/Driver Selectable Mode, Sequential Shift Control and Oil Cooler, Tires: LT285/70R17D OWL AT, Tire Specific Low Tire Pressure Warning, Tailgate Rear Cargo Access, Systems Monitor. 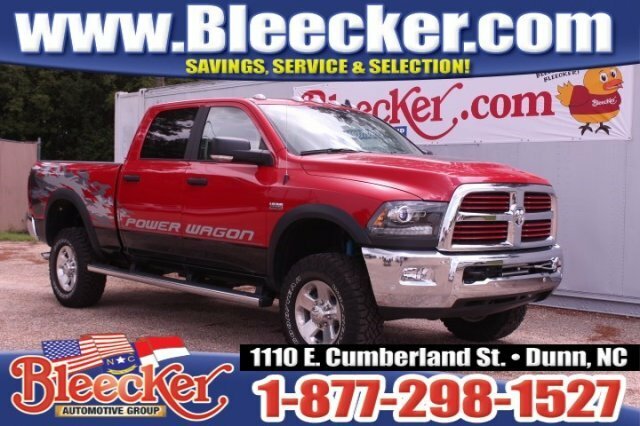 Stop By Today For a hassle-free deal on this must-own Ram 2500 come see us at Bleecker Chrysler Dodge Jeep Ram, 1110 E Cumberland St, Dunn, NC 28335. Just minutes away!, Power Sunroof,SiriusXM Traffic,115V Auxiliary Power Outlet,Folding Flat Load Floor Storage,Integrated Voice Command w/Bluetooth,GPS Antenna Input,Media Hub,5-Year SiriusXM Travel Link Service,Uconnect Access,Overhead Console w/Garage Door Opener,Power Lumbar Adjust,Charge Only Remote USB Port,Auto Dim Exterior Mirrors,Glove Box Lamp,Steering Wheel Mounted Audio Controls,HD Radio,Rear 60/40 Split Folding Seat,Power Heated Fold-Away Mirrors,Front Center Seat Cushion Storage,Exterior Mirrors w/Supplemental Signals,Radio: Uconnect 8.4 NAV,GPS Navigation,4.10 Rear Axle Ratio,Engine: 6.4L V8 Mid Duty HEMI MDS,Quick Order Package 22P Power Wagon,Electroluminescent Instrument Cluster,Premium Cloth 40/20/40 Bench Seat,Single Disc Remote CD Player,5-Year SiriusXM Traffic Service,Transmission: 6-Speed Automatic,SiriusXM Travel Link,LED Bed Lighting,Exterior Mirrors Courtesy Lamps,Power Folding Mirrors,1 Year Trial,Underhood Lamp,ParkSense Front/Rear Park Assist System,Front Armrest w/Cupholders,Universal Garage Door Opener,40/20/40 Split Bench Seat,Sun Visors w/Illuminated Vanity Mirrors,Luxury Group,Remote SD Card Slot,Rear Dome w/On/Off Switch Lamp,50 State Emissions,8.4' Touchscreen Display,Leather Wrapped Steering Wheel,For Details Visit ,Power 10-Way Driver Seat This Ram 2500 delivers a Premium Unleaded V-8 6.4 L/392 engine powering this Automatic transmission. Wireless Streaming, Wheels: 17' x 8.0' Aluminum, Vinyl Door Trim Insert. This Ram 2500 Comes Equipped with These Options Vendor Painted Cargo Box Tracking, Variable Intermittent Wipers, Valet Function, Urethane Gear Shift Knob, Trip Computer, Transmission w/Driver Selectable Mode, Sequential Shift Control and Oil Cooler, Tires: LT285/70R17D OWL AT, Tire Specific Low Tire Pressure Warning, Tailgate Rear Cargo Access, Systems Monitor. 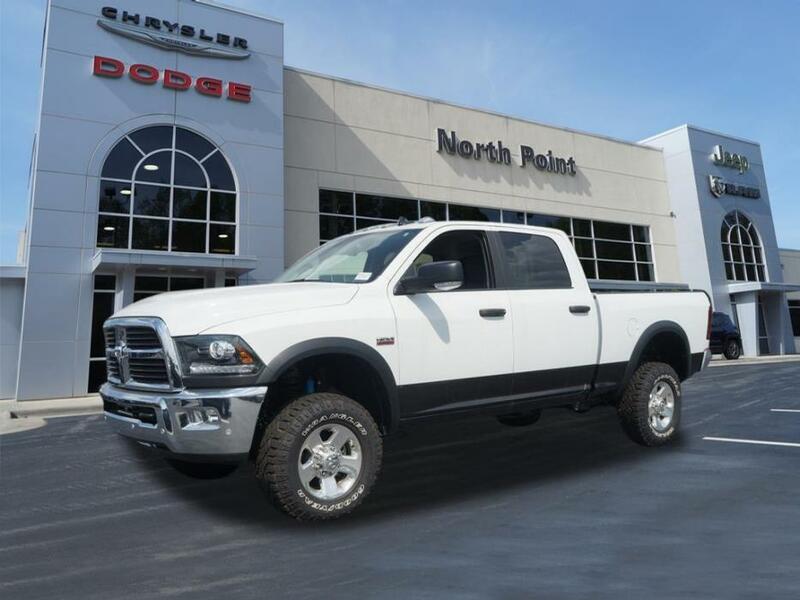 Stop By Today For a hassle-free deal on this must-own Ram 2500 come see us at Bleecker Chrysler Dodge Jeep Ram, 1110 E Cumberland St, Dunn, NC 28335. Just minutes away! Thank you for viewing our new 2016 Ram 2500 Power Wagon 4x4 Truck! Our Internet Price includes a competitive, sub-invoice discount and $4000 in Southeastern Region Cash Rebates. Other incentives and programs may apply. These incentives are scheduled to expire on 8/31/2016. At North Point, you don't have to sacrifice great customer service to get a great price! Call now to confirm availability and incentives. 2500 Power Wagon, Included Dealer options extra. Not all Guestswill qualify for all rebates. See Dealer for details., 115V Auxiliary Power Outlet,4.10 Rear Axle Ratio,40/20/40 Split Bench Seat,50 State Emissions,6 Month Trial,8.4' Touchscreen Display,9 Alpine Speakers w/Subwoofer,Air Conditioning ATC w/Dual Zone Control,Auto Dim Exterior Mirrors,Charge Only Remote USB Port,Electroluminescent Instrument Cluster,Engine: 6.4L V8 Mid Duty HEMI MDS,Exterior Mirrors Courtesy Lamps,Exterior Mirrors w/Supplemental Signals,Folding Flat Load Floor Storage,For Details Visit ,Front Armrest w/Cupholders,Front Center Seat Cushion Storage,GPS Antenna Input,Glove Box Lamp,Heated Front Seats,Heated Seats & Wheel Group,Heated Steering Wheel,Integrated Voice Command w/Bluetooth,LED Bed Lighting,Leather Wrapped Steering Wheel,Luxury Group,Media Hub,Nav-Capable! See Dealer for Details,Overhead Console w/Garage Door Opener,Power 10-Way Driver Seat,Power Folding Mirrors,Power Heated Fold-Away Mirrors,Power Lumbar Adjust,Premium Cloth 40/20/40 Bench Seat,Quick Order Package 22P Power Wagon,Radio: Uconnect 8.4,Rear 60/40 Split Folding Seat,Rear Dome w/On/Off Switch Lamp,Remote SD Card Slot,Steering Wheel Mounted Audio Controls,Sun Visors w/Illuminated Vanity Mirrors,Transmission: 6-Speed Automatic,Uconnect Access,Underhood Lamp,Universal Garage Door Opener Included Dealer options extra. Not all Guestswill qualify for all rebates. See Dealer for details. 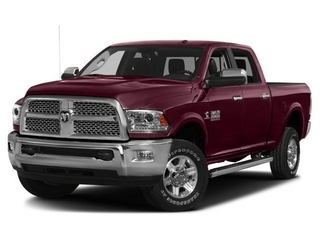 2500 Power Wagon, Introducing the 2016 Ram 2500! Both practical and stylish! This model accommodates 6 passengers comfortably, and provides features such as: adjustable pedals, a bedliner, and remote keyless entry. It features four-wheel drive capabilities, a durable automatic transmission, and a powerful 8 cylinder engine. We know that you have high expectations, and we enjoy the challenge of meeting and exceeding them! Stop by our dealership or give us a call for more information., 1 Year Trial,115V Auxiliary Power Outlet,220 Amp Alternator,4.10 Rear Axle Ratio,40/20/40 Split Bench Seat,5-Year SiriusXM Traffic Service,5-Year SiriusXM Travel Link Service,50 State Emissions,8.4' Touchscreen Display,9 Alpine Speakers w/Subwoofer,Auto Dim Exterior Mirrors,Black MIC Exterior Mirrors,Charge Only Remote USB Port,Electroluminescent Instrument Cluster,Engine: 6.4L V8 Mid Duty HEMI MDS,Exterior Mirrors Courtesy Lamps,Exterior Mirrors w/Heating Element,Exterior Mirrors w/Supplemental Signals,Folding Flat Load Floor Storage,For Details Visit DriveUconnect.com,Front Armrest w/Cupholders,Front Center Seat Cushion Storage,GPS Antenna Input,GPS Navigation,Glove Box Lamp,HD Radio,Integrated Voice Command w/Bluetooth,LED Bed Lighting,Leather Wrapped Steering Wheel,Luxury Group,Media Hub,Overhead Console w/Garage Door Opener,ParkSense Rear Park Assist System,Power 10-Way Driver Seat,Power Adjustable Pedals,Power Folding Black Trailer Tow Mirrors,Power Folding Mirrors,Power Heated Fold-Away Mirrors,Power Lumbar Adjust,Premium Cloth 40/20/40 Bench Seat,Quick Order Package 22P Power Wagon,Radio: Uconnect 8.4 NAV,Rear 60/40 Split Folding Seat,Rear Dome w/On/Off Switch Lamp,Remote SD Card Slot,Remote Start System,Security Alarm,SiriusXM Traffic,SiriusXM Travel Link,Spray In Bedliner,Steering Wheel Mounted Audio Controls,Sun Visors w/Illuminated Vanity Mirrors,Trailer Tow Mirrors,Transmission: 6-Speed Automatic,Uconnect Access,Underhood Lamp,Universal Garage Door Opener Introducing the 2016 Ram 2500! Both practical and stylish! This model accommodates 6 passengers comfortably, and provides features such as: adjustable pedals, a bedliner, and remote keyless entry. It features four-wheel drive capabilities, a durable automatic transmission, and a powerful 8 cylinder engine. We know that you have high expectations, and we enjoy the challenge of meeting and exceeding them! Stop by our dealership or give us a call for more information.